One of my few genuine talents is my ability to add two and two together and make five. Here is an example of that talent. We bought our first house in Twickenham in the early nineties. It was just off Twickenham Green and it was really great. Our years there were simply wonderful and I remember them as being eternally sunny and peaceful. The Twickenham Tramp moved about on the periphery of my consciousness for a long time. I would see him heading down to the Thames on my way to work, or encamped in a shop doorway across the street from the bus stop. He had a long beard and a long rain coat and he was a tramp. I should have noticed more about him - I fancied myself to be a writer back then too – but it was busy times and I didn’t. I liked that, I felt like I was living in a real community, who might watch out for their homeless residents as well as everybody else. That little notice brought Trampy Joe firmly into my radar, and I started to look at him more closely. He was not your run-of-the-mill tramp. For starters, he didn’t drink, he was always shy and reserved and sober. He had a shopping trolley on which he kept his worldly goods and these goods were stored in large, expensive, steel camera cases, five or six of them, all neatly stacked. It was almost as if Trampy Joe was wheeling his way through an airport concourse and off on a flight to Nairobi to film cheetahs. ... expensive camera cases, reserved, quiet, notices in the supermarket about him. Peter Green was living as a tramp on my street!! There was no internet then, or if there was, I certainly didn’t have it. So I couldn’t just click and see a picture of Peter Green. I had to go to the library and look him up. All of the photos were of Green as a young guitarist. Could he be Trampy Joe? Yes he could. I watched him now with fascination and told many people who he was but I didn’t ever speak to him. My bag may not have been quite as expensive as his but I too was shy. Whenever Trish went away for work, I was in the habit of indulging in some serious junk food. One Friday, I was facing into a solitary evening in, I had some videos in my bag and a yen for some fried chicken (go figure). Trampy Joe was parked outside the entrance to KFC, looking a bit mournful. I drummed up some courage and spoke to him for the first time. “Well… if you are treating me to something…,” He stated this formally, in a gentle voice, rather as if a contract was being drawn up between us. “Yes, I am.” I said. I stumbled to the counter in the restaurant and started my order. I didn’t get very far. I had a fillet burger and a coke, it was all I could afford. Trampy Joe thanked me very politely and I left him to his meal. Some months later, the famous rock guitarist Peter Green re-emerged on a festival stage in Berkshire, fragile but well. He wowed the audience with his playing just like the old days. It was not my Trampy Joe, he was still down the main street, no doubt eating chicken. But I don’t begrudge Trampy Joe his chicken feast. I know that I didn’t buy it for him because he was a famous rock superstar, down on his luck. I bought it because he was Trampy Joe and that was enough. What a nice story. I was disappointed to find out that Trampy Joe was not Peter Green. Thanks for reading Lyndi and best regards to you. That's a GREAT story. Sometimes five is just better than boring ol' four anyhow. Trampy Joes are everywhere--those people we pass by in the street or just don't see. Any one might have been someone famous, or someone incredibly gifted, or someone who means the world to someone else. We don't see... but what if something opened our eyes? It's like the story of Joshua Bell playing in the subway. One night he's packing a symphony hall at $100 a seat, and a few days later when he played the same music as a simple busker, nearly everyone just walked on by. Falls into the category of "you just never know"...are we passing a brilliant scientist pushed over the edge into madness or just some guy who doesn't care? As always, an interesting read. When I lived in the city (Toronto) there were a lot of street people. Some were very scary, some just very dirty and kind of scary. I was careful when I passed them. I know of a woman who was physically attacked by a street person. She had done nothing to start anything, just noticed he was following her then he grabbed her and tore her face open with his fingernails. I admit I avoid them as much as I can. A few times I found women who were living that way. I've given them some money when I could but carefully. Twice I had conversation with them when they were in front of the grocery store or the pharmacy with a lot of people traffic around. I've listened to their stories, with interest. But I never assume they are harmless. I have always had a fascination with tramps - long before I'd even heard of Waiting for Godot. Our town couldn't even sustain one tramp. My first experience of them was when I had to meet one of my bosses in the centre of Glasgow when I was sixteen. Typical me I was an hour early and so wandered around the side streets to see what I could see and what I saw was an old tramp fast asleep in a doorway. I had never seen anything like it. It had a tremendous effect on me and inspired one of my first half-decent poems, 'Street Games'. There used to be one tramp I ran across on a regular basis, usually in Central Station. He had wild, ginger hair and a beard to match. He reminded me so much of myself - some unkempt future me - I always felt very unsettled every time I saw him. That was great - really awesome story! Laura: One certainly has to tread carefully. Jim: There's something in that - there but for the grace of something-or other go I.
I'll never forget the first time I heard 'the green manilishi with the two pronged crown. . .' Peter Gree was quite the song writer. Fabulous! I heard Fleetwood Mac on my way to work today - one of their LESS famous works - Monday Morning - but one of my favs thanks to an ex-boyfriend. Its a good memory and I know you get how powerful that song memory connection is. Happy Friday! Saw him live last year - awesome. Funny - a friend yesterday mentioned another Twickenham recluse (i.e. tramp) and said, "You know, apparently he was a high-powered City lawyer once", which prompted me to dredge up the story of 'Peter Green' outside McDonalds and Blockbuster in 1994. I remember someone giving him some money and saying "Hi Peter, how are you?" I also remember how 'Peter' mysteriously disappeared when the other Peter started getting a lot of press coverage as he re-emerged from his seclusion and started releasing best-selling albums. Wonder where Twickenham 'Peter' is now? Anyway, it was nice coming across your blog entry when I Googled "Peter Green Twickenham". 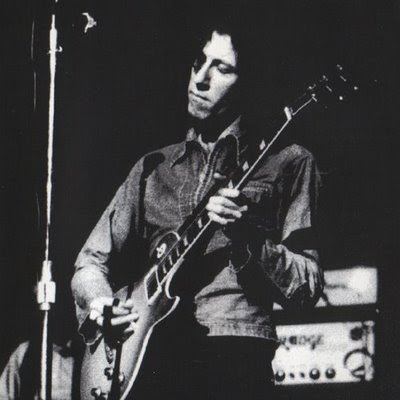 I used to see Peter Green on the Lower Mortlake Road in Richmond during the early 1980's. He used the wander around in a fawn coloured duffle coat with long hair and long fingernails. My local butcher pointed him out and told me that he was living in Michels Row Richmond at a relative's house. I also used to see him wandering around Kingston at that time. He didn't look too much like a tramp more like a scruffy hippy, a bit scary though as he just used to stare into shops but most of the shopkeepers along there knew who he was. I was trying to convince my daughter (13 and into Fleetwood Mac!) that I had seen Peter Green in the doorway of Woolies in Twickenham in the early 90s. As I started to read this I felt vindicated, then as I read I realised I too had made the same error. Interesting how many of us had come to the same conclusion.